Upon opening the application, the user is shown a delightful home screen and accompanying music. The app opens in landscape mode and takes a little while to load. The home screen provides an array of information such as the user profile and account in the top left as well as options to invite friends, display leader boards, change settings and switch accounts, this could be ideal for students in the classroom where multiple accounts may feature. There are small adverts that appear along the bottom of the app which do not inhibit the game play. Coins that the user collects for correct answers are displayed in the top bar along with other options to earn extra coins, in-app instructions and in-app purchases where the user can use coins to purchase extra features. These extra features include "Advantages" where the user can see letters, receive extra time or have access to a "hint". "Power ups" include restart times, letter and image reveals. "Avatars" where the user can change their avatar and "coin packages" where further coins can be purchased. It is noted that the app is played in landscape mode and on a small device the keyboard can restrict the screen somewhat. We recommend that the app is played on a tablet or that the developers consider that the game could be played in portrait mode if on a smaller device. The gameplay can be in single mode or multiplayer. 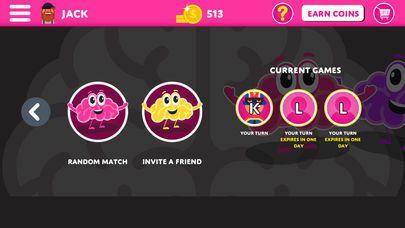 Multiplayer allows the user to invite friends or play a random match. It would be ideal to see a class group playing each other. There is also a fantastic option where you can try puzzles that have been created by other players. We really enjoyed this section although some of the puzzles are incredibly difficult and some simply didn’t make any sense. Once the single player mode has been selected the user is greeted with clear and colourful graphics. The game play is delightful and has a real quirky feel to it, especially the music. Images are shown in the screen for the user such as a "Dragon" and a "Fly" to create the word "Dragonfly". The user types in their answer on the responsive keyboard which must be spelled correctly. Some users might find that the exact spelling is difficult at times due to the word combinations. The developers could consider a message that tells the user the answer is right but the spelling is not. Coins are earned for a correct answer and celebrated. Earlier levels focus on two picture word combinations out of 10. There a three reveal answers available, however, this does play adverts too if chosen. Level 2 uses similar word puzzle images but combines two or more to make the puzzles harder along with addition and subtraction of words. Some of these pictures puzzles are ingenious in their logic and some were simply way too hard so reveals were used to progress further. We found the app great fun and highly addictive, however, it was rather frustrated to find that we couldn’t move on further without the in-app purchases some of which didn’t actually help with solving the puzzle, such as revealing one letter. 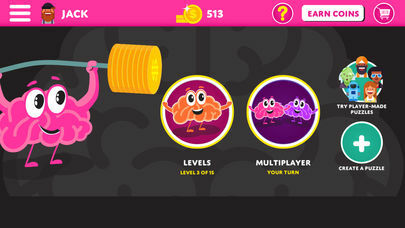 As the levels progress the puzzles include ‘past tense’ such as ‘eat’ and ‘ate’ and ‘opposite’ such as ‘low’ and ‘high’, once again this adds to the differentiation of game play modes and level of difficulty. 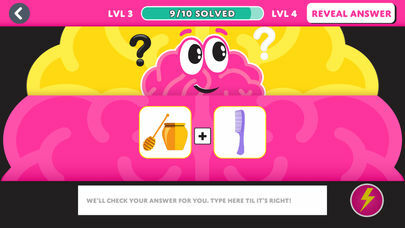 There are 25 levels in total results in over 100 brain teasing puzzles. Equii is an addictive word game that challenges you to solve puzzles by combining images, letters, and numbers. 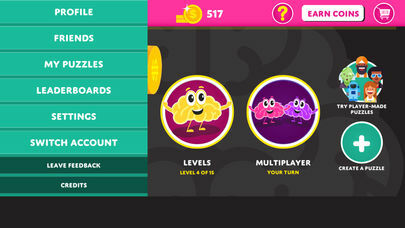 Compete head to head against a random brainiac or pair up with a friend. Race the clock and your opponent to solve puzzles for coins. Each Equii solved makes you one coin richer! This isn't your grandma's word game, things can get tricky with addition, subtraction, and other modifiers. When you're ready to challenge yourself, try Equii's new Levels mode with more than 100 puzzles hand-picked to exercise your brain!